Campion’s Winter Program provides students with the opportunity to engage with the great minds of Western Civilization who have engaged in the pursuit of truth. Students are able to meet academic staff, use facilities and resources, ask questions, and attend seminars across the fields of History, Philosophy, Theology, and Literature within a particular overarching theme that is different each year. Students are encouraged to broaden their minds, think critically, argue persuasively and engage with the big questions that line the path to truth. In addition to this snapshot of academic life, students are given the joy of sampling Campion hospitality – sharing delicious meals and participating in a variety of fun activities at our charming and picturesque campus. Our winter program offers an examination of society and culture that is unique, and it is a wonderful opportunity that is not to be missed. Participants are greatly enriched by the academic formation they receive, the terrific fun they have, and the strong bonds of friendship that they forge. All of these gifts remain long after the week is over. 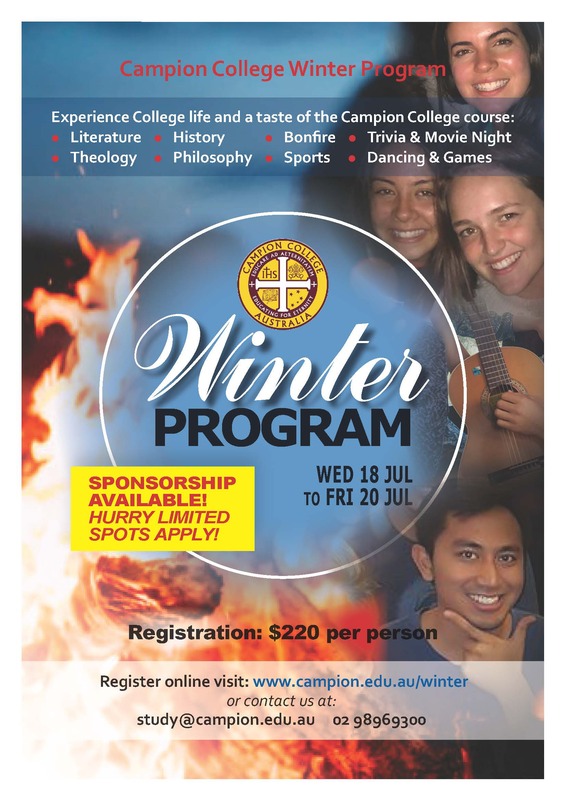 The Campion Winter Program held on the 18-20 July is open to all young people aged from 16 – 24 years. There is sponsorship available and this will waive the cost for home-school students.